Bakasura is one of the playable Gods in SMITE. A horrendous demon with a bottomless appetite for human flesh, Bakasura is a nightmare come to life. After committing countless atrocities, Bakasura has demonstrated no end to his depravity, no limits to his brutality, no sating his desire to slurp human meat, crunch bone, and guzzle hot blood. So many are his vile victories over mankind that they cannot be relayed here, yet it his defeat at the hands of a man that is worth the telling. According to the Hindu epic, the Mahabharata, the famous Pandava brothers were traveling in exile with their mother, Kunti, when they came to the village Ekachakra. Disguised as brahmins, they sought alms from the villagers in order to sustain themselves. They soon learned that a demon, Bakasura, was living outside the village, devouring the people as they passed through the woods. The chief went to the demon and begged that the feasting stop. In return, a cart of food would be sent to Bakasura each day. Bakasura consumed not only the provisions, but the person that brought the cart as well. After hearing this tale from a weeping woman whose son would bear the cart on the morrow, Kunti declared that her son Bhima, who possessed impossible strength and had slain demons before, would take the cart instead, as repayment to the kindness the villagers had shown their family. Once in the forest, Bhima nonchalantly ate the food intended for Bakasura. Furious, Bakasura threatened to eat Bhima, which he just laughed off, goading the demon to attack him. All day they battled until Bhima finally slew the demon, tied him to the cart and dragged the body back to the village, where the people celebrated the victory in bewilderment. 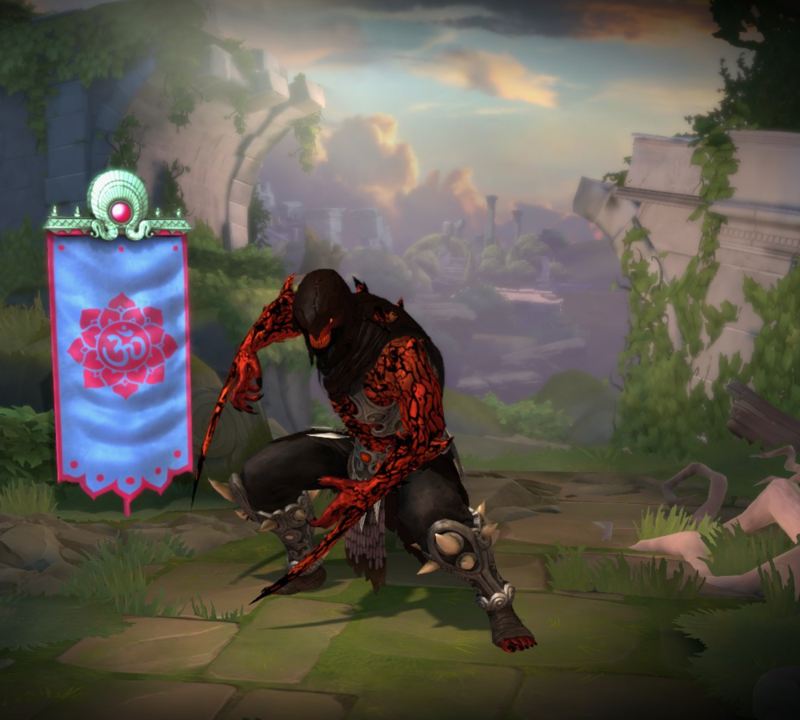 Hunger, however, is a demon that cannot be defeated and, inevitably, Bakasura's disgusting rumble will rise again, now more ravenous than ever and ready to feed. Grants up to 24% bonus Attack and Movement Speed. Has a post-fire of .2s. Has a projectile speed of 120. The minions are melee units that have 1.5 attack speed, 400 health and inherit Bakasura's penetration. Minions have a lifetime of 8s. On Basic Attack hits, deal Physical Damage equal to 3% of the target's maximum Health. If the target has over 2000 Health, the bonus damage scales up. This effect reaches a maximum of 5% of the targets Maximum Health at 2750 Health. Using this item buffs all allies Movement Speed by 40% in a 70 unit radius for 5s and makes them immune to slows. Their healing is also increased by 25% for the duration. As Bakasura eat twenty five minions using eat minion in a single match. As Bakasura get three kills on enemy gods with the damage from Butcher Blades. In 2014, Bakasura received a remodel, changing his default, Butcher and Mastery skins, his Death Machine and Feaster Bunny skins were unaffected by this change. This skin and Valkyrie Freya were the first Tier 2 skin introduced in the game. This skin preserved Bakasura's original voice pack and animations. 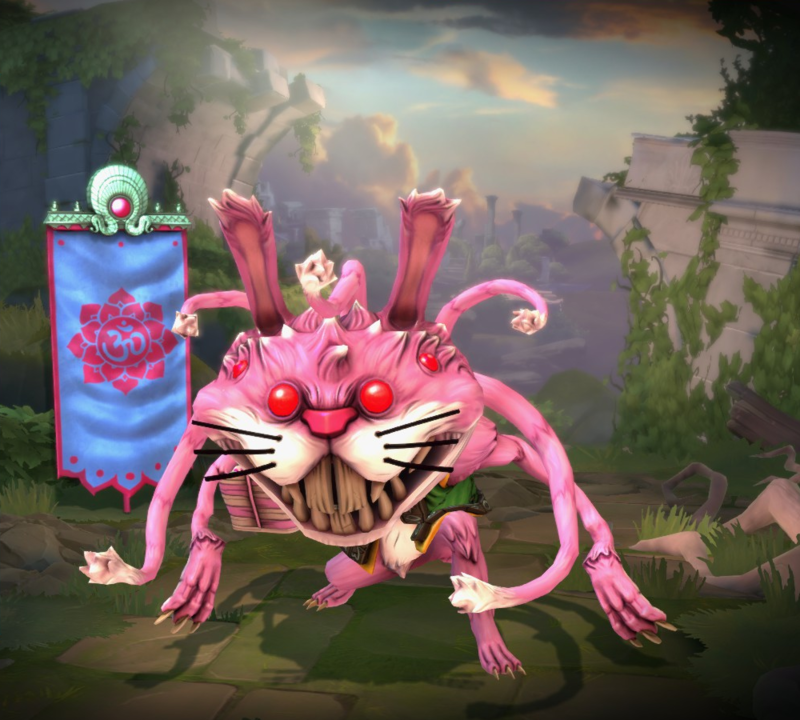 Bakasura's Feaster Bunny skin originated as a fan creation, and was eventually added due to popular demand. Bakasura's direct taunt towards Agni, "Two heads are tastier than one! ", as well as Feaster Bunny Bakasura's direct taunt towards Agni, "Two heads are tastier than one! Buhaha! ", are altered versions of the English saying Two heads are better than one. One of Feaster Bunny Bakasura's taunts, "Silly immortal, my tricks are for eating you! ", is a reference to the slogan "Silly rabbit, Trix are for kids." for the American cereal Trix. One of Feaster Bunny Bakasura's jokes, "I'm no ordinary rabbit", is an altered version of a quote from the film Monty Python and the Holy Grail. This skin shares its theme with Chaacolate Chaac, BunBun Nox and Playful Bunny Nu Wa. This skin is based on the myth of forest spirits. This skin shares its theme with Shadow Spirit Ah Puch and Shadow Stalker Izanami. This skin was a reward for those who reached Gold V during Season 1. Rage Bakasura's quote when activating Butcher Blades, "Got beef? ", is a reference to the song Got Beef by Tha Eastsidaz. One of Rage Bakasura's Low Health quotes, "No one makes me bleed my own blood! ", is a quote from the film DodgeBall: A True Underdog Story. This skin was given as a reward to any players that reached Gold 5 or higher during the Season 1 League. Fixed an issue where Bakasura could eat deployables he shouldn't be able to eat. Minions from this ultimate will no longer remove backdoor protections. Increased Camera Height from 42 to 64. Fixed an issue where Take Down debuff would display confusing damage calculations in the combat log. Fixed an issue where the percentage damage increase effect was not additive. This ability no longer decreases Physical protection of enemies hit by it. This ability now causes enemies hit by it to take 10% increased Damage from all sources. Decreased Post-fire animation time from .7s to .2s. This ability now places an additional targeter over targets that can be instantly devoured. Increase Projectile Speed from 80 to 120. 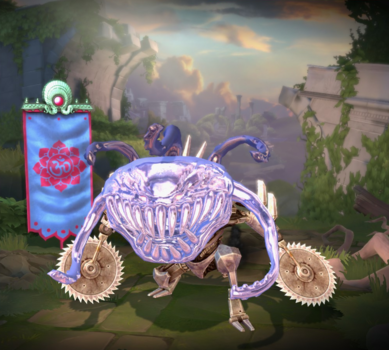 Bakasura may now choose to eat his own minion pets from this ability. Gross. Large monsters that can only be eaten at 33% will provide 2 Minions toward Regurgitate. Decreased Cooldown from 90s → 90/85/80/75/70s. Increased Slow from 15/20/25/30/35% → 20/25/30/35/40%. Changed Slow duration to be 4s instead of applying only in the area. Increased Cone Attack Duration from 5s → 6s. Fixed an issue where his Voice Pack was too quiet. Bakasura can now consume any non-buff jungle creature at 100% of it's health, including Mid Harpies and Boars. Fixed being unable to eat the small minions at the Blue camp in Conquest. Can no longer emote during Regurgitate with the Death Machine and Feaster Bunny skins. Updated tooltip to show how much damage minions deal. Reduced damage dealt by minions from 20 to 15 per attack. Fixed an issue where Bakasura would double leap. Fixed untextured assets at end of match lobby. Fixed Feaster Bunny eyes in lobby showing white instead of red. Fixed rank 4 applying a 60% slow instead of 30%. Fixed an issue where removing or becoming immune to the slow would also remove the cripple effect of this ability. Fixed a bug which allowed you to cancel the leap after casting. Bakasura has received a major visual makeover! Death Machine and Feaster Bunny skins are unaffected by this change. Fixed his inability to eat Nu Wa Clay Soldiers at ranks 2-5. Yum! Fixed a bug where bakasura would deal damage before he landed. Fixed buff icon tooltip text to reflect actual buff values. Updated targeter for Feaster Bunny and Death Machine skins. The vomit puddle now has a nice shiny liquid metal look to it for the Death Machine skin. Base Attack Speed gained per level reduced from 2% to 1.6%. Fixed an issue where after the 1st taunt, Bakasura's body would freeze until he performs an action. The duration of the crowd control immunity has been reduced from 3s to 1.5s during this ability. The regurgitation area has been changed to a volume to remove Cripple as soon as the enemy leaves the area. This fixes an issue where players would be Crippled for longer than intended. The regurgitated minions now play a different death animation and sound to avoid confusion of Bakasura dying. The FX playing on you indicating that you are in the regurgitation area has been changed to be more clear. The duration of the slow and cone attacks has been reduced from 6s to 5s. Using Purification Beads will now immediately remove Cripple from the user. 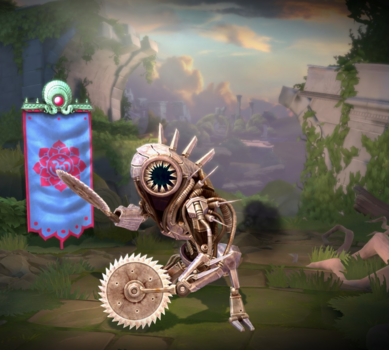 This ability has been changed to reduce the physical protection of the targets by 20 instead of lowering their damage dealt. This ability now applies Cripple to all enemies caught within the radius. The amount of time that Bakasura is doing cone attacks during this ability has been properly set to 6s, as intended. The previous time was 4s. Fixed an issue with Bakasura’s digestive system where he was not correctly regurgitating the large furies. The projectile now arcs higher and flies slightly faster, decreasing the delay on when it is deployed. This ability now makes Bakasura immune to crowd control for half the duration of his ultimate (3s). Fixed bug that allowed some ranks to deduct mana in some cases where a minion can't be completely eaten. Fixed issue with tooltip for Rank 1. The Attack Speed buff has been increased from 3% per stack to 10% per stack. The Movement Speed buff has been increased from 5% per stack to 10% per stack. The maximum number of stacks has been reduced from 5 to 3. The base healing of this ability has been reduced from 80/140/200/260/320 to 70/120/170/220/270. Physical power contribution has been added to this ability, increasing by 70% of your physical power. This ability no longer scales off of Focus. Attack speed per kill is increased from 2% to 3%. Each kill also gives a 5% run speed buff for 10s, stacking up to 5 times. The base healing has been increased to 80/140/200/260/320 and no longer scales off of Focus. Movement speed buff has been removed from this ability. Eating a minion now gives him a 10/15/20/25/30 buff to magical and physical protection. Old - 35/60/85/110/135, increasing with Focus up to 270. New - 60/95/130/165/200, increasing with Focus up to 360. Old - 5/10/15/20/25%, increasing with Focus up to 35%. New - 10/15/20/25/30%, increasing with Focus up to 45%. The amount of healing has been reduced from 100/150/200/250/300 to 70/120/170/220/270. The cooldown has been increased from 15/14/13/12/11 to 18/17/16/15/14s. Decreased the speed of the jump to fall more in line with other jumps. Base amount healed reduced from 125/175/225/275/325 to 100/150/200/250/300. Reduced the duration of the movement buff from 6s to 5s. True damage has been reduced from 15/30/45/60/75 to 10/25/40/55/70. 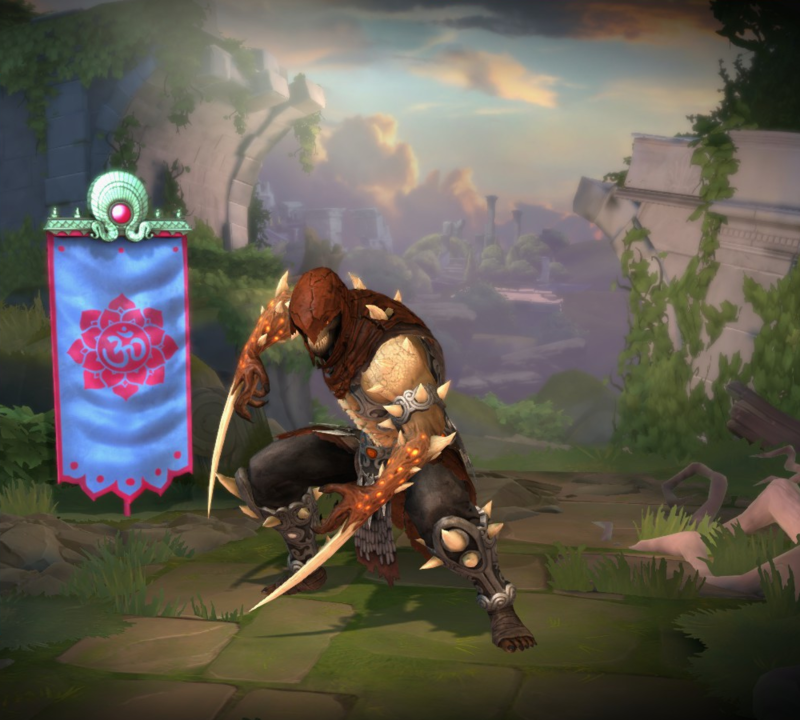 Bakasura has been added to the game.